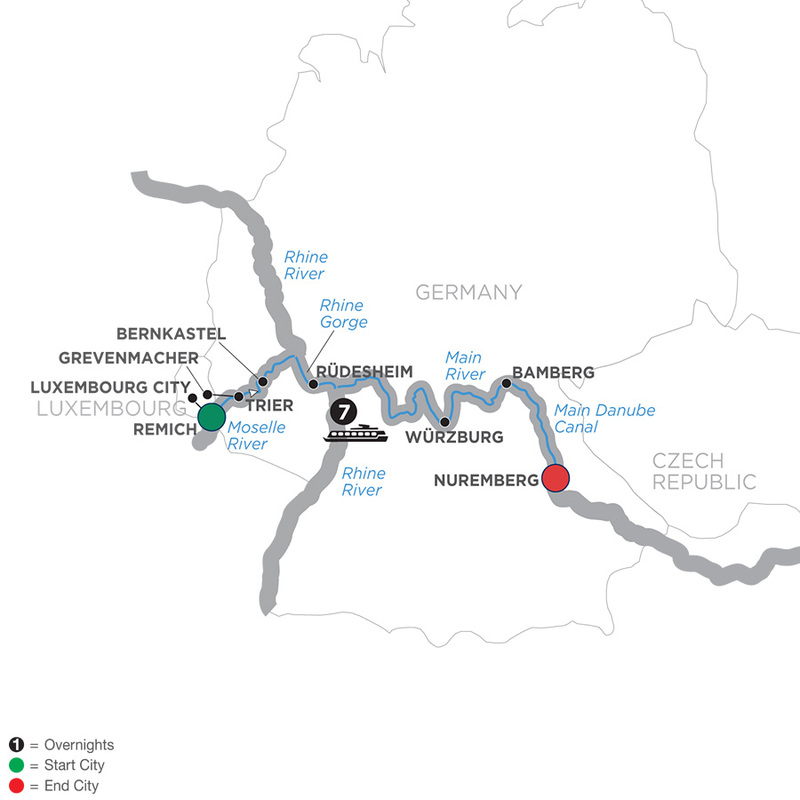 This river cruise through central Europe will start in Luxembourg and take you across Germany on the Moselle, Rhine, and Main Rivers, as well as the fascinating Main Danube Canal. Your European river cruise will get underway on the enchanting Moselle River. Make your way to the ancient city of Trier, Germany—believed to be even older than Rome. Many remnants of ancient Rome can still be found, such as imperial baths and the Roman Bridge, with stone pilings dating from 144-152 AD. Try some of the best wines the Moselle valley has to offer, in the wine village of Bernkastel, home to Germany’s largest expanse of vineyards. This beautiful town will fascinate you with its narrow streets and half-timbered houses which have been standing since the Middle Ages. Your river cruise will continue through the dramatic Rhine Gorge, considered the most enchanting stretch of the Rhine River, where you’ll see ancient castles standing majestically on cliffs 400 feet above the water. On the Main River, stop in Würzburg—the “Pearl of the Romantic Road” and see the magnificent baroque Bishop’s Residenz and the largest ceiling fresco ever painted. With free time, you may want to stop in a Konditorei (German pastry and coffee shop) for a delicious local favorite and experience a German afternoon tradition! 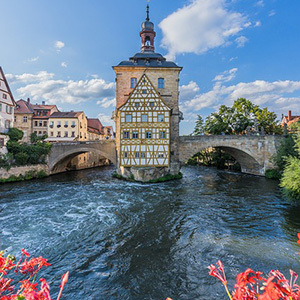 In Bamberg, marvel at the 13th-century Romanesque cathedral and the Altes Rathaus (Old Town Hall)—built on an island in the middle of the Regnitz River. Your European River cruise is waiting to show you intriguing destinations, and charming out-of-the-way spots for an unforgettable experience like no other vacation tour can!